very pretty. looks like you’ve had a good trip! Thanks. It was a rather long trip and I wish it hadn’t been so hurried, but I accomplished what I wanted to and had time for at least a few photos along the way. Lovely finds. Sure are a different sort of tulip than I’m used to seeing! I was interested to find that name for them, but I think it fits. The desert is beautiful now as a result of all of the rain they had this winter. I wish I had had more time to enjoy the southern desert, but that wasn’t to be. Thanks Stacey. 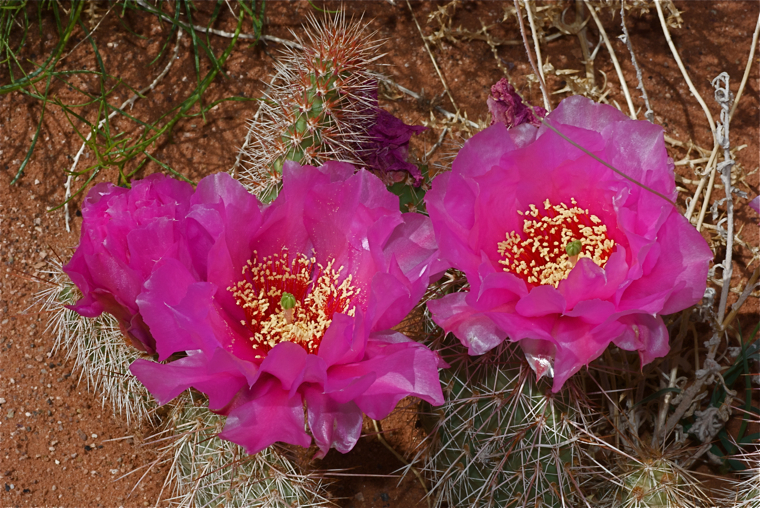 I have especially liked the prickly pear cactus for many reasons including their beautiful blossoms. Many times I’ve seen them used for food and protection by the desert animals. Great to see you back, Montucky! I’ve always liked the prickly pear cactus and the one I had growing was a fatter, flatter kind with yellow blossoms. The flowers are kind of waxy. These bright pink tulips with teeth are lovely! Nice shots! Thanks Anna. For a long time I thought the one with yellow blossoms was the only prickly pear. The spines on this one are more dense too and it must be harder for the critters to use it for food. We even have very small ones in the eastern part of Montana on the high plains. Amazing how beauty always seems to have an edge in the desert. 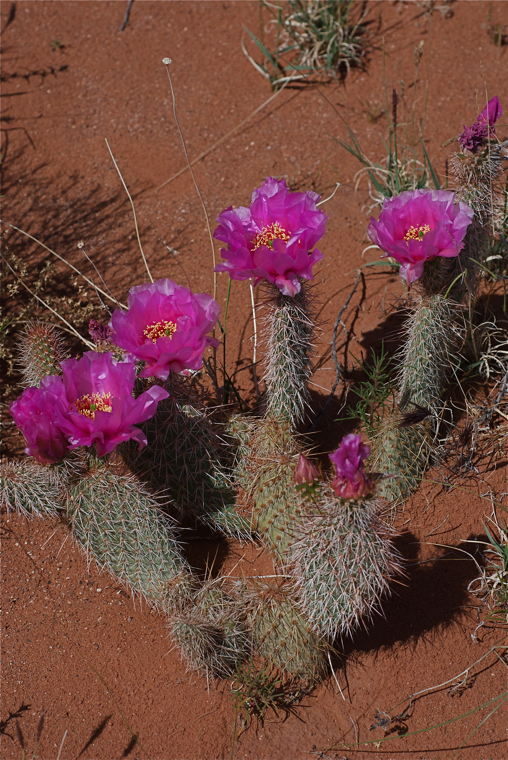 I’ve always found lots of beauty in the desert, especially this time of year when many of the cacti are in bloom. Glad you are back Terry, I missed my morning visit to your site. Keep up the good work. Thanks Rich! Even tough it was a short trip it was wonderful to see Montana again. I remember the days when I came here only to visit. Glad to see you had a nice time in AZ, Terry! Love the up close photos of the “Desert Tulips”! When I first saw these I thought they were Beavertails but the spines are more like to regular prickly pear. Had to look them up! That is a very pretty color, isn’t it! I was very happy to find these in bloom! What color! Must be that red dirt. 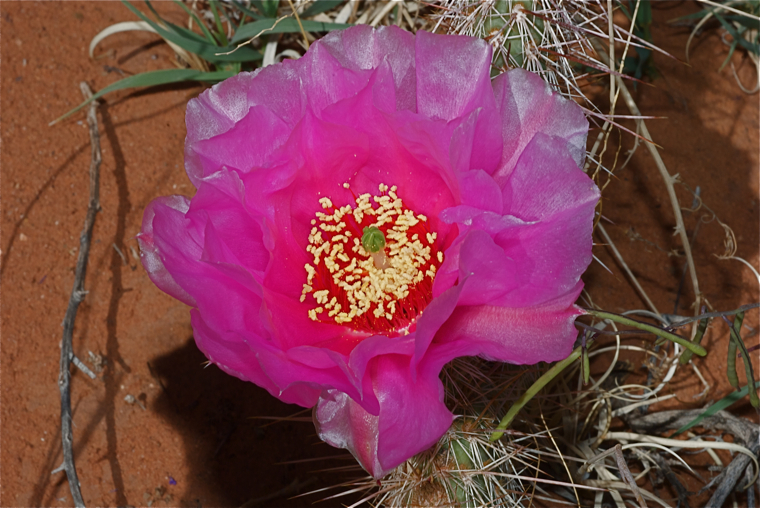 We had prickly pear cactus in Oklahoma, but I think the flower were pale green. Nothing like this showy version. I wasn’t familiar with this type of prickly pear either. It was in a rather high desert area. What fantastic photographs of the cactus! They are pretty but I would not want to step on them or fall on those stickers. Those spines can be a hazard. They are quite stiff and will penetrate pretty far. When I lived there I always carried a small pair of flat-nosed pliers because of them. Yes, they do look more like poppy blossoms, although they are rather waxy like a tulip. I’ve seen the bright pinks before but didn’t know this was a tulip pricklypear. The angle from which you shot in the 2nd photo makes the flower so awesome-looking. It is an especially pretty year in the AZ desert, isn’t it? Cool that you got to Page, can’t wait to see what else you saw. I had to look these up because I wasn’t familiar with them. I think the blossoms are just gorgeous! Yes, the desert was especially lush and beautiful. I came in through Page then from Flagstaff I cut over by Lake Mary, Mormon Lake and Happy Jack then down through Payson to Mesa. The low desert was just beautiful but because of some time constraints I wasn’t able to stop for pictures and that was a major disappointment. On the return trip I spent a few days in Prescott Valley and then back up through Page. That day it was both cloudy and hazy, but I caught a few of the high desert flowers in bloom and just a couple of landscape photos in southern Utah. I’m not very pleased with what progress has done to that area though. Wow – what a fabulous texture and colour those petals have. Cactus flowers are amazing. Cactus really know how to celebrate spring. This year they are especially nice because of all the rain they’ve had in the past winter. I am just wondering the amount of plants and flowers You have found. All of them are worth to watch with care and to take time to admire them. These are about a thousand miles south of where I live, and there are a very many different ones to be found there. Despite the fact that I lived there many years I’m sure I haven’t seen them all.